﻿While we may tweak the wording of our mission statement, a church’s mission doesn’t change, because Jesus defined our mission 2000 years ago. Hilltop’s mission statement, however, is different from those of most American churches in one important way. In our individualistic culture, most church mission statements are individualistic, focusing on producing individual followers of Christ. We believe that what the church is called to produce is not individual followers who come together to support each other, but rather a radically countercultural community that embodies the life and teaching of Jesus in our life together. We accomplish God’s mission in the world not primarily through operating programs that people can participate in nor by individual witness (though these have their place), but by living out together an alternate way of being society that demonstrates the reign of God. It is mainly through the witness of the faith community that we are salt and light in the world. We believe that three key relationships—we call them the Three Loves—encompass everything we are called to be as a church: loving God, loving one another (within the church family), and loving our neighbors (those outside the church family). As a church, we are called to do nothing more and nothing less than to live out the Three Loves together. If anything we are doing is not an expression of living out the Three Loves, we need to change it or quit doing it. In the end, nothing but relationships matters. ﻿Unlike a church’s mission which never changes, vision is a moving target. It is a picture of what we believe God is calling the church to look like five or ten years in the future. Since the church serves a changing community, and since the leaders God places in the church changes over time, a church’s vision can and should change over time. A vision is a picture of God’s preferred future for a specific church family. The vision God has given our leaders is unique. 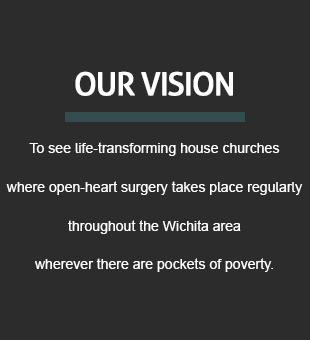 We are the only church in the world with our vision. At the heart of Hilltop’s mission are our house churches, small groups that meet in homes. While all our house churches come together to worship on Sunday, our house churches are our most important gatherings and Sunday morning is secondary.